Join the discussion on our forums! Come discuss Research Project over in our dedicated Research Project discussion topic. Awesome card! I love this one! I usually use this vs. Priests or Warlocks or Rogues that have their hand full or with 9 cards. Overdraw them. Feels so gooood! This is a much better version of Coldlight for Mage because it is a spell, which can be combined by Sorcerer's Apprentice, Flamewaker, etc. Much cheaper too. Draw is good for any deck but this is particularly useful for tempo decks which usually run out of options rather quickly. 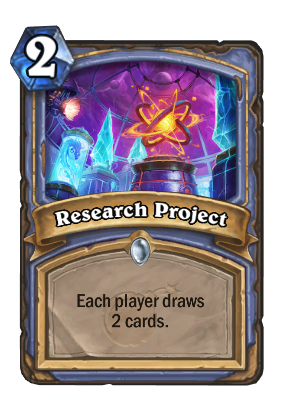 It's a cheap alternative for F2P players that don't have the dust to craft Aluneth or Book of Specters. It also punishes combo and control decks since those types of decks like to keep a ton of cards in hand. It's a pretty good card. Mage didn't get any direct burn spells but I feel like draw will make this kind of decks more reliable. More card draw for mage and your opponent, exciting but dangerous. The battlecry of a murloc from the hall of fame.